Share "What is the Difference Between a Cultivator and a Tiller?" To the uninitiated, tillers and cultivators may sound like two terms for the same thing --as if the words were completely interchangeable. The fact is they’re not. Though they are similar in design and concept, they are quite different and are intended for two specific purposes. Essentially, a tiller is the larger of the two and is used primarily during the beginning of the year to prepare new gardens for the growing season. Tillers are often used at the end of the year, as well, to mix all leftover vegetation into the soil for decomposition. Tillers generally dig deep --up to 8 inches of soil can be churned. Only once the plants have begun to sprout does a cultivator begin to do its job. Cultivating is defined as loosening the soil around growing plants. A cultivator does just that. Cultivators do not churn as deeply as tillers and are often used between rows; keeping the weeds at bay while helping to aerate the soil. This way, the plants benefit from loose soil, which allows more water and fertilizer to get to their roots. By keeping the weeds’ growth down they won’t be able to rob your plants of water and nutrients. If your gardening space is less than 100 sq. 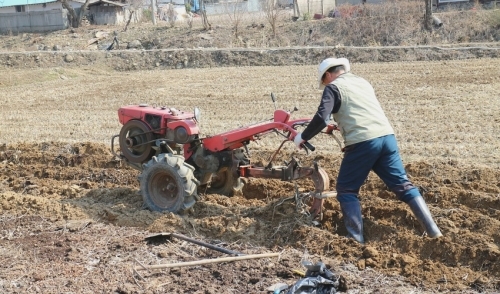 ft., you may be able to use a cultivator in place of a tiller to prepare the soil for planting as well as cultivating during the growing season, thus avoiding the need for two pieces of equipment. For a job larger than that however, the tiller/cultivator combination works best. If you plan on tilling once a year, then renting may be your best option. The cost of purchasing a tiller, in addition to maintaining and storing one, can be much higher than simply picking one up at your local rental dealer, using it and returning it when you are finished.